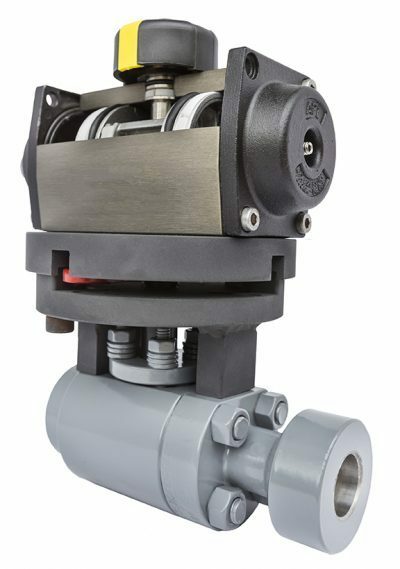 ValvXpress® – for customers who demand quick delivery of a zero-leakage automated valve solution for severe service water and steam applications. The package includes the superior quality of the V1-1 valve and ValvTechnologies’ actuator, backed with the best four-year guarantee in the industry. ValvXpress® pre-engineered, automated packages are compact, robust and ready to ship. Integral metal seat.. With our patented HVOF RiTech® coating process, the integral seat in ValvTechnologies’ rotary operating valves are resistant from the attack of abrasive magnetite or ferrous oxides in the steam flow. Zero-leakage backpressure protected bi-directional sealing. This superior back pressure protected sealing capability comes standard with the V1-1 Series valve. ValvTechnologies’ standard design prevents the upstream load spring from collapsing in a reverse flow condition. The design protects the internals from damage after an upset condition and guarantees shutoff in the reverse direction. Zero-leakage shutoff. Shutoff is absolute zero-leakage, exceeding the requirements of ANSI/FCI 70-2, ANSI B16.34 and API 598. Visit www.presentation.valv.com for more information. The Total Package: This package includes the superior quality of the V1-1 valve, integral stop mounting kit and ValvTechnologies’ actuator, backed with the best four-year guarantee in the industry. Build-Your-Own: This package includes the superior quality of any ValvTechnologies’ valve, integral stop mounting kit allows customers to choose custom accessories based on their specific needs.